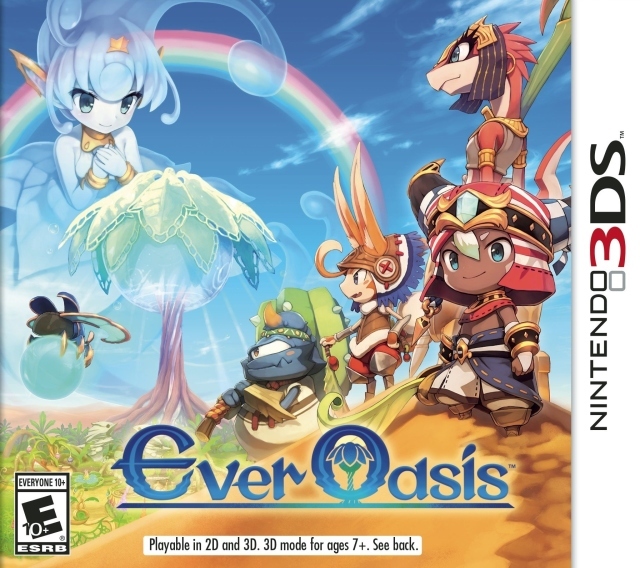 Ever Oasis from Nintendo and developer Grezzo kicks off our July series of reviews. Is it worth picking up? It sure is, but see if it's right for you with SuperPhillip Central's in-depth review. You'll get more than your just deserts with this game. No doubt many Nintendo fans have shifted their attention away from the Nintendo 3DS and towards the Nintendo Switch, and so much so that many find displeasure in seeing games even still coming out for the 3DS. After all, obviously the smart decision business-wise would be to turn one's back on the 60 million+ user base on the 3DS (a system that still sells) and put everything on the Switch, a console that can barely stay in stock as it is. Point being, such an attitude is a bit shortsighted. That notwithstanding, that means a lot of new Nintendo 3DS games that release after the Switch won't get as much attention or hype. One of these 3DS games launched recently worldwide, and it's an original effort by developer Grezzo. After enhanced ports of two games in The Legend of Zelda franchise, Grezzo got the opportunity to work on an entirely new franchise, Ever Oasis, and they teamed up with the brains behind the Mana series to do it. Ever Oasis is set in a world that is covered with sand thanks to the presence of an evil in the land known as Chaos. Few precious oases remain, where groups of people gather, protected by a Water Spirit and led by a chief. Your character, of which you can name, lives in his or her brother's oasis, an abundantly prosperous one where he is the chief. One day the dark force of Chaos attacks the oasis. With his final act, your brother transports you out of harm's way while the Chaos engulfs you and your brother's former home. Now, awakening nearby a small pool of water, your character meets up with a lonely Water Spirit named Esna who squeals with delight that she has a new friend. Together, you two aim to bring life to your small oasis, find out what happened to your character's brother, and vanquish the Chaos menace so the world can return to its former glory. Even the most prosperous oasis had to start from somewhere. Who knows--maybe our hero's oasis can be that oasis! The beginning of Ever Oasis is a bit slow and plodding, offering extended tutorials on how to build and expand your new oasis, but it offers enough variety to not be too terribly tedious. Though it might be on subsequent play-throughs... Regardless, the goal of your oasis is to lure visitors from faraway lands by performing various tasks. The initial visitors will arrive automatically, and by performing the objective(s) necessary to satisfy them, they will permanently move into your oasis. When enough residents have made your oasis their home, you will have the opportunity to expand your oasis and level it up by talking to Esna. In doing so, your oasis will grow larger, perhaps adding more shop space for you to build or grow your garden to cultivate more crops, and so forth. Your new denizens of your oasis will then provide rumors as to how to lure other prospective visitors to your new home. This can be by having a specific shop in your oasis or by discovering them in a specified area outside of your oasis. Welcome to my humble oasis abode, new resident! There are a number of tribes within the world of Ever Oasis. Seedlings are the most prevalent, and they're able to open different shops depending on the character. Unlike traditional shops in RPGs like this, you're not actually the one doing the shopping in them. Instead, you provide materials gathered from defeated monsters, discovered from mining and digging, and through other means to stock the goods that shop requires. Sold stock gives you Dewadems that serve as the currency of the game, used to build new shops and buy goods from merchants. It's a good idea to keep shops fully stocked, as when they run out, it affects your overall oasis' happiness. When that is lower, you have less HP to work with when you exit your oasis and enter the outside, dangerous world. Add new shop types to attract new visitors to your oasis. When you've stocked a given shop enough, the owner will want to speak with you about performing a side quest for them. These range from simple material-hunting quests to defeating a certain enemy in a specific area of the game. Once a shop owner's side quest has been successfully completed, their shop will expand, being able to sell not only more quantities of goods but new types of goods as well. Now, early on it can be somewhat strenuous to always have enough materials to fully stock each shop you have. However, as you progress in Ever Oasis, you access the option to send AI characters out in groups of three on one-to-two day material-finding expeditions. This means you need not do all the work of gathering a particular resource all by yourself, and instead you can look at the available materials in a given area of the world, send your team out, and hope for success. Materials are also used to synthesize new weapons, accessories, costumes, and items, all done inside your home. Once you finally decide to leave the comfy confines of your oasis, you'll find a sizable world to explore. Of course, at first, you're rather limited in where you can go, as natural roadblocks and ability-related roadblocks, requiring a specific character type, block your progress and opportunity to fully explore. That said, Ever Oasis does an adequate job of revealing the world to you in a way that isn't too slow and on the opposite side of the spectrum, isn't too overwhelming. There are main overworld areas with multiple caves to them, each with their own trials and things to discover within them, some of these caves serve as paths to other overworld areas. As you recruit new characters from having them move to your oasis permanently, you can use their special abilities or weapons to access new areas within Ever Oasis' world. For instance, the tall and lean, lizard-like Drauk tribe is known for using spears as their weapons, and specific levers which hang on walls can only be pulled down by people using spears. These levers open doorways and remove obstacles that would otherwise be impossible to pass. Likewise, certain characters have special abilities that are exclusive to them, such as some Seedlings being able to use specific flower pads to fly and float in the air, crossing over chasms and reaching faraway platforms, or Seedlings that can coil up into a ball like an armadillo and pass through holes to reach other sections of dungeons. This Seedling's ability summons a leaf wall to block rolling boulders like the one incoming. The usage of these weapons and abilities to interact with the indoor areas of Ever Oasis is pretty novel, though an annoying issue is that while you can have three characters in your party, you can't switch them out except when you're back in your oasis. Now, while you're able to use a teleportation skill called the Aqua Gate to immediately transport back to your oasis to do so, it's still an inconvenience to have to do that every time you lack the proper ability necessary to solve a certain puzzle or progress in a specific part of a cave or dungeon. Thankfully, you can use the warp in your oasis to return to the site where you originally used your Aqua Gate, but it's a slight annoyance all the same. The indoor areas within Ever Oasis are the ones where the puzzles and challenges present themselves. Most of the time you'll be in cavernous areas, but other areas present developer Grezzo's teachings with their remakes of the Nintendo 64 Legend of Zelda games by adding in puzzle-filled dungeons complete with obtaining keys and facing a colossal boss by the dungeon's conclusion. And of course, defeating that boss earns you one of the MacGuffins of the game. The dungeons are nicely themed, offering plenty of moments of pure action alongside pure puzzling, but the puzzles don't really get too spirited or impressive until late in the game, unfortunately. All puzzles, though, will have you switching between your hero character and your two party members, who are otherwise controlled by the AI. It wouldn't be a dangerous dungeon without some deadly swinging hazards, right? Going along with The Legend of Zelda: Ocarina of Time 3D and Majora's Mask 3D's influence on Grezzo's design in Ever Oasis is the combat. Here, you can lock onto targets, though this time you're not stuck on any axis to avoid their attacks. You have full directional movement available to you. You have a light attack and a strong attack, which obviously takes longer time to get off, and you also have an evasive roll when an enemy gears up to attack. As you gain experience levels, you get typical stat upgrades, but also more powerful combos to deal more damage to enemies. Enemies are classified by types depicted by an icon next to their name. Certain weapons are strong against certain types of enemies while others do limited damage. Combat is seldom dull or frustrating, and this is due to the game generally throwing multiple enemies at you at a time. Thankfully, a purple icon on the bottom portion of the screen indicates when a foe is behind you. After our party beats you, you're going to be crying Iguanagator tears. Ever Oasis is a pretty lengthy experience. Most can complete it and battle the final boss within about 20-25 hours. However, once the final baddie has been beaten, the game opens up even more. Post-game content is available in the form of new visitors to lure to your oasis, optional boss battles, and unique dungeons where the bronze, silver, and gold slabs players will most likely come across in their adventures come into play. Here, placing three slabs will determine what kind of enemies, items, and challenges you will face, changing the experience each time. There is a risk/reward factor here, as dying means you forfeit all of your collected items within the dungeon, so if you reach a place to exit the dungeon, you might want to give it a second thought before deciding to progress further. We're not retreating. Honest! We're just... Okay, we're retreating. I'm not the type who can't stand to look at the low resolution of the Nintendo 3DS despite the Nintendo Switch being the new hotness, as the kids say. Thus, Ever Oasis looks and runs pretty well to me. Moments of frame-rate issues were rarities at worst, the character and environmental geometry were glorious to look at, and the animations were pleasant enough. Perhaps the only gripe in the visuals came with the 3D effect. The only real 3D came from text boxes being more pronounced while everything else in the game was pushed back, so I declined to leave the 3D slider up at all. It wasn't worth the more significant loss of battery life to me. When it comes to audio, the music has some token tracks that are delightful while everything else sort of comes off as forgettable. The sun sets once more on the desolate desert. Did anyone bring a flashlight for nightfall? Being Grezzo's most important original effort yet, I'm floored by how much I enjoyed Ever Oasis. Niggling things like having to return to my oasis to switch characters, occasional camera bothers, and material grinding got in the way of my overall enjoyment, but not so much as to cancel out my adoration with the game. Ever Oasis is a glorious action-RPG adventure set in the desert, and one that won't even get sand in your shoes. There's no better praise than that!